”Absolutely, I think it’s really important that we look at that top end of the pitch,” Lambert said when asked whether a striker was top of his summer wish list. Are the wheels already in motion on that front? “We’ve spoken about centre-forwards, but a lot will be down to finances as well, which always happens anyway so you know that. Asked whether he knows what he’ll have to spend in the summer, Lambert said: “I know what’s happening at the club. You guys will get to hear soon, I’m pretty sure. Keane, who scored three goals following his loan move from Hull before suffering a hamstring injury, is out of contract in the summer. The Tigers have an option to keep him for a further year but are not expected to take it up. What are the chances of the 26-year-old being the frontman Lambert signs in the summer? “I don’t know, again the money side of it plays a big part, there’s no getting away from that. There’s got to be a realistic view to it. “I don’t need to see Will any more times, I know exactly what he can do. I saw him before in previous years, I know exactly what he can do. “I know he’s had his injuries from the past and the bad one with his knee and he’s picked up a hamstring problem with us. “I go back to it, I don’t know what he’d done before, how fit he was before [he came here] but one thing is for sure, I know he was playing really well here when he did get injured and he scored three goals himself and losing him was a blow because he was playing really, really well and scoring. Norwood has been linked with the Blues on a number of occasions recently with a report from HITC Sport earlier today claiming Town were leading the chase ahead of Burton Albion and Fleetwood Town. 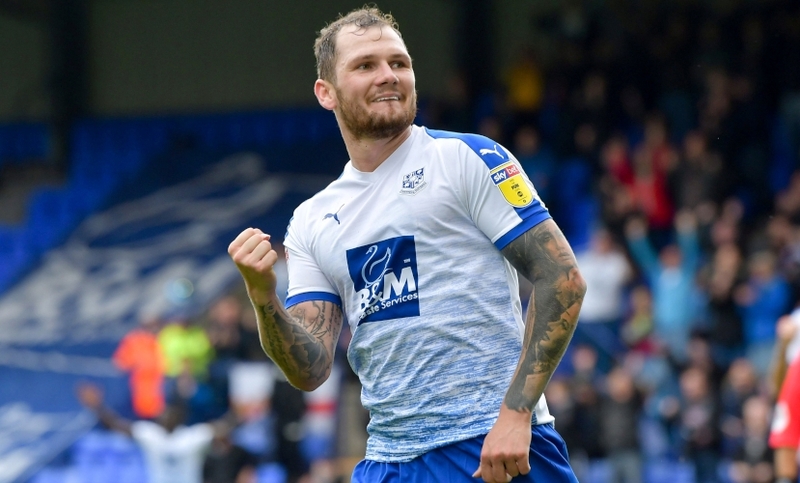 The 28-year-old has scored 29 times this season for Tranmere and is out of contract and available on a Bosman, a market Lambert has confirmed he will be looking at in the summer. Quizzed on whether there is anything in the claims regarding Norwood, Lambert said: “No, not at all. There’s a few areas of the field which need a little bit of strengthening. Forward areas is one of them, there’s another few areas where I think we’re lightweight and we have to get people in. I’d like Norwood, but there’s no way you could justify having Keane, Jackson, Harrison, Sears and Norwood on a league one budget. I expect to see Jackson and/or Harrison sold or loaned out next window although personally I think those two would be ideal together as a front 2 in league one. Think Sears, Norwood and Jackson are a decent League 1 strike force. Wouldn't expect Keane and Norwood to sign, would also expect Harrison and Roberts to move on. I have had to reassess the probability of lower league players being able to make the step up after what I've seen this season. Pre-season, I thought Jackson was gonna be the nutts nuts, but it was too big a jump and even at League 1 level I don't see him being prolific, would rather see Jackson moved on, he is Hurst's man after all. Norwood looks fantastic from the highlights reel, but I have trust that PL knows what he is looking for, and whether he thinks he would make the next step up, unlike Hurst who took a huge gamble that didn't work. Hope we can get Norwood. The essence is that we should continue to place our trust in Paul Lambert ; he is professional , enthusiastic ,a good man Manager and objective at the same time .Keen on communication ,he plainly gets on with the owner and we are starting to see a very real change of atmosphere and structure which will only stand us in good stead . Feel fairly certain PL will , like MM , be looking essentially for character and physical ability so that incomers ,barring the unfortunate, will go in to next season raring to go with confidence to impose ITFC on the game . Norwood would be a far better option - sad, but true that Keane has, and will, spend more time in the treatment room than on the pitch. We've had, and seen, enough of that type of player- and unfortunately still paying some .. !! A good natural striker, with the right desire, and attitude, should be able to score goals at any level. ........ the treatment room is an easy option for some shrinking violets, and there are some. You'll get no game criticism if you're not playing, some prefer that, if they can get away with - and it still pays well .... !!! Keane has had an injury ravaged career and is yet again erm, injured. Why on earth would we carry a player like that on a league one budget? Time for Keane to move on. Any player can pick up a serious injury. Look at poor Mings; we sold him with an excellent injury record for a fat fee, he was crocked in his first game for Bournemouth and has hardly played since. Whether it be new signings or players already on the books I reckon Paul Lambert will be assembling a squad with one eye on the Third Division and one eye on the season after promotion (hopefully not too long in coming) so players with Championship experience (even ones like Jackson who have struggled to step up) will count for more. What about Quaner he’s the man of the moment! 2 great finishes on sat seems to be playing with confidence at last. He could ruin league 1!! I’ve left out Nolan as I’m not impressed, but could swap him for Roberts on the bench. Ade(ex that lot up the road who spent so long on the treatment bench needs to go). Knudsen will go as he won’t want to play third tier. My thinking is crystal clear, dolphin 🐬 blue????? Keane would be decent but tbh i’ve had enough of injury prone players so i’d prefer Norwood. Can’t say i’ve seen anything in Harrison as a goal threat - Jackson has something about him & always works his arse off whenever i’ve seen him play - Sears will be like a new January signing when he’s back. A goalscorer is a must this summer. When are Sears and Adeyamis contracts up----would release them both the minute they do,and also Ward. This is not a care home.